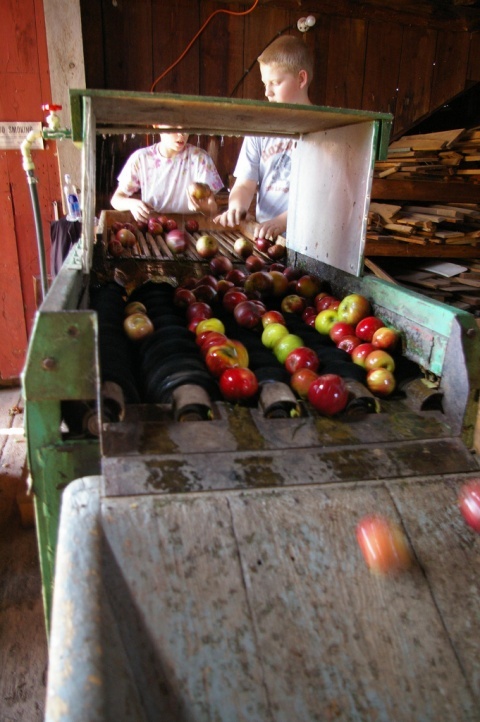 Above: A photographic tour of the enormous apple cider press at the Hubbell homestead. Click on the slideshow to open the the tour in a separate window. Photos by Julia Reischel. It’s a good year for apples in the Catskills. Call it the silver lining of all that rain. All over the mountains, on the roadsides and up in the hills, wild apple trees that usually don’t make much fruit have decided to make this year a banner year. Fallen apples litter sidewalks and trails. To grab a perfectly edible snack off a branch, all you have to do is reach and grab. Apples destined for the cider press at the Hubbell homestead. Photo by Julia Reischel. “This is the first year in probably five years that there have been any wild apples up here,” says Bob Hubbell, the 77-year-old cider master at Hubbell Companies, a multi-generational family business in the hamlet of Kelly Corners in Delaware County. Hubbell says it’s been a busy few weeks. Commercial apple orchards are also doing well, according to Jim Allen, the President of the New York Apple Association. A wet spring and the flooding the region saw this fall may have played a role in the bumper crop. Size isn’t everything, though. Allen says that this year’s weather conditions also made for sweet apples. So what do you do with your apples? You can always gather them and eat them. Or you can make cider. 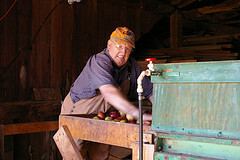 Bob Hubbell loads apples onto a conveyor belt on the top flood of his cider press barn. Photo by Julia Reischel. At Bob Hubbell’s, you can watch a 93-year-old one-horsepower Fairbanks engine power a tremendous chain of flywheels and wooden conveyor belts and chutes and iron gears to press 64 bushels of apples at once. The whole contraption, which was built in the 1860s, fills three stories of a red barn in the back of the Hubbell homestead property on Rte. 30 in the town of Middletown. I followed the smell of apple juice and visited the press in action last Saturday. Just as I arrived, a truck of apples was being loaded into a conveyor belt on the top floor of the press barn. The apples rise up into a machine that crushes them, and the resulting pulp -- skins and seeds and all -- sludges down a chute into the room below, where the empty rack and cloth press is waiting. A team of two men spread the pulp onto a cloth laid out on a rack. When the cloth is full, they tuck the edges snugly over the pulp and place a new rack on top. They slather, tuck and stack a few more layers, and then move the whole sandwich under the looming vise-like press itself. Hubbell’s press looks like a huge cast-iron car jack sitting atop a wooden rack. Fully extended, the press exerts about 150 tons of force. A single pressing can yield 250 gallons of juice, all of which sluices down into a trough that leads to a pipe in a floor. Tasting the cider from the Hubbell's cider press. Photo by Julia Reischel. When the press is loaded, Bob Hubbell pulls a lever and gears began to turn. The press began to squeeze, and within a minute juice runs out through the cloth and into the trough. The room, full of apple-pressing clients, gets loud and boisterous as everyone grabs a cup and dips into the trough to taste the new juice. Hubbell, in the meantime, keeps a sharp eye on an orange lever quivering at the top of the press. When it rises to a certain height, the press has reaached its maximum pressure: close to 150 tons. At the right moment, Hubbell turns the press off again, and everyone troops down yet another flight of stairs. On the ground floor of the barn, two plastic cisterns collect the cider. Each is rigged with something that looks for all the world like an antique gasoline pump. (Hubbell says that it’s manufactured specially for cider.) Out come containers of all shapes and sizes, and Hubbell begins decanting. According to one of the clients pressing apples the day I was there, the batch of apples I saw yielded about 2.5 gallons per bushel. As I left, I walked past a row of freshly-filled gallons and half-gallons. Some of it was bound for the freezer, to be thawed in six months when our abundance of apples is only a memory. Renting the Hubbell press costs $40/hour and requries a four-bushel minimum of apples. To contact Bob Hubbell for an appointment, call 845-586-4777. 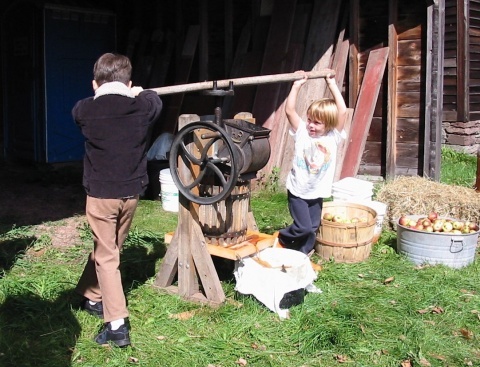 A pair of energetic visitors turns the crank at Woodchuck Lodge to apply pressure on the crushed apples to produce cold tart cider. Photo by Diane Galusha. You don’t have to have a three-story cider-press to get your own cider. 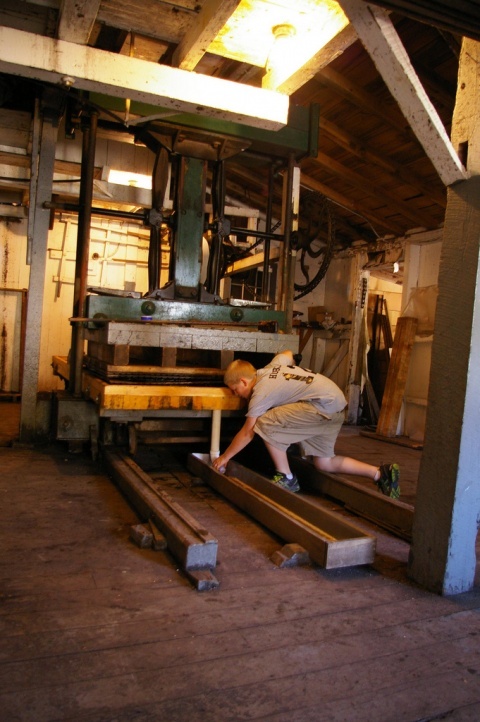 Other, smaller cider presses are run by hand. 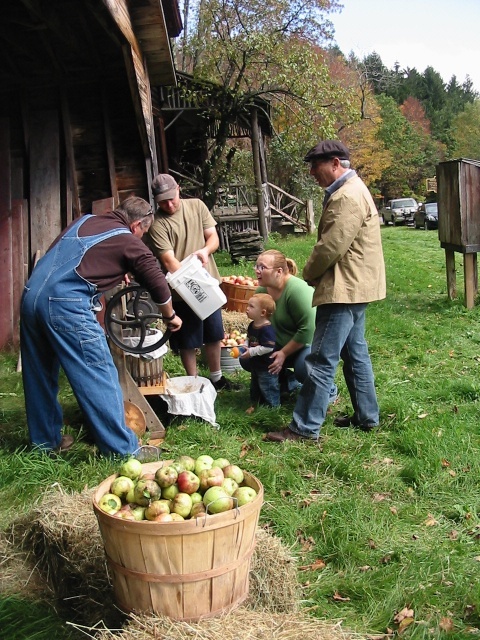 On October 2 at Woodchuck Lodge in Roxbury, the ancestral home of the eminent nature writer John Burroughs, a hand-cranked apple press was in service to make cider out of the Burroughs apples growing in the nearby orchard. Diane Galusha, a local writer who works at the Catskill Watershed Corporation, was on hand to take photos. The Stekketes family watches John McDaniel run the apple press at Woodchuck Lodge in Roxbury Sunday. Looking on is Bill Birns, tour guide for the day at John Burroughs’ summer home. Photo by Diane Galusha. In Shandaken this past weekend, another hand-cranked press was the center of another gathering. Henry E. Needham had donated it to be the centerpiece of a fundraiser thrown by the Shandaken Democratic Committee. Needham's press managed to produce some tasty cider, according to event organizer and candidate for town supervisor Kathy Nolan. But cider-making has its hazards: as the cider-makers increased the pressure on the press, one of its supporting wooden legs gave up the ghost, ending the day’s pressing early. If you want to try your hand at making your own cider, you don’t even need a press. If you have a food processor or a blender, you can be in business, according to this article from Cornell Cooperative Extension. If you’re concerned about bacteria, pick the fruit off the trees and avoid apples that have already fallen. (They’re more likely to have been stepped on or worse.) Avoid rotten apples for obvious reasons.